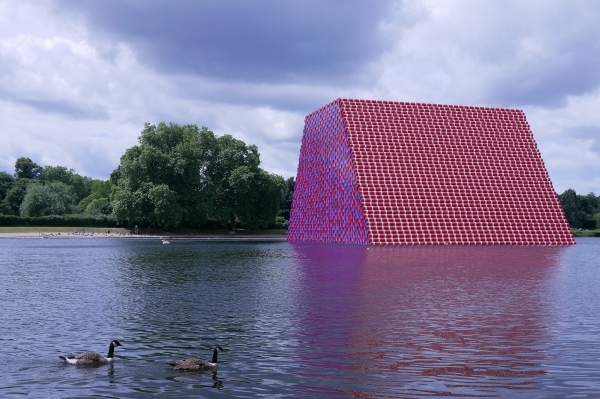 The work of internationally renowned artist Christo, The London Mastaba floats serenely on Hyde Park’s Serpentine, despite the reported ruffled feathers of some swimmers upset over its installation in their pool. The floating sculpture, which takes up about one per cent of the lake’s surface, is Christo’s first public sculpture created for show in the UK. Made up of 7,506 multi-coloured and stacked barrels reaching 20 metres high, the sculpture sits on a floating platform of high-density polyethylene cubes which has been anchored into place. The artwork’s installation coincides with an exhibition of the work of Christo and his late wife Jeanne-Claude’s at the nearby Serpentine Gallery in Kensington Gardens. 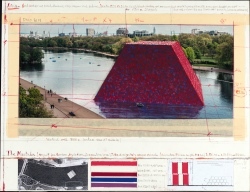 Christo & Jeanne-Claude: Barrels and The Mastaba 1958-2018 features sculptures, drawings, collages and photographs spanning more than 60 years and, according to Christo will provide “important context” for The London Mastaba. The exhibition can be seen at the gallery until 9th September. Meanwhile, the sculpture will be floating on the Serpentine, weather permitting, until 23rd September. 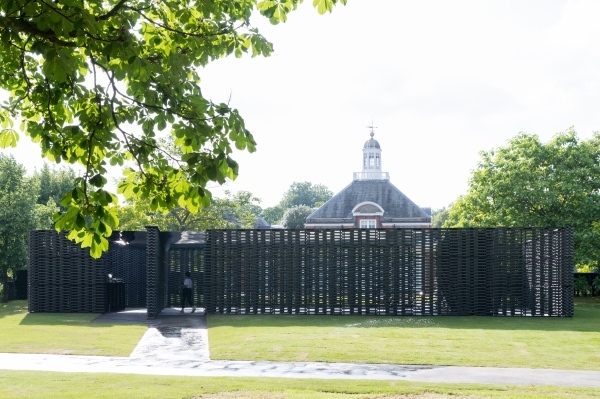 And finally, the Serpentine Gallery’s annual temporary pavilion – this year the work of Mexican architect Frida Escobedo, of Taller de Arquitectura – can be seen until 7th October at the Kensington Gardens’ gallery. For more information on all three projects, see www.serpentinegalleries.org.